It is not uncommon that colleagues of mine ask for advice on what new and useful apps are out there. When they do, I find it difficult to persuade them to experiment with paid apps, especially when there are dozens of free, though lesser quality, versions on the App Store that accomplish similar tasks. An example of a paid app that I have long advocated for is TextExpander. This app is available for OSX and iOS, but the Mac version is the one I cannot live without. 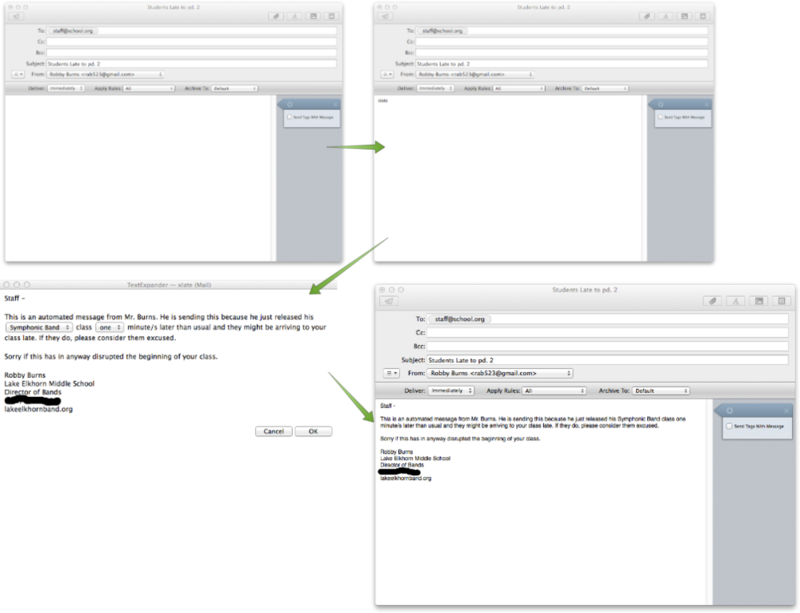 TextExpander allows users to create custom snippets of text that expand into larger bodies of text upon entry. For example, I have set it up so that typing “haddress” generates my home address. Typing “pemail” generates my personal email address. The process works kind of like autocorrect, only the entry and result can be customized however I want. See below for an example of the TextExpander app, complete with my library of snippets. By the way, this feature is already available to all Mac users in the keyboard settings in the System Preferences (see below). Don't let that stop you from trying TextExpander, though. It is far more powerful than the feature built into OSX. For example, TextExpander can expand dynamic data. I can type “ddate” and it will fill in the current date like so: October 1, 2014. “Ttime” does the same thing for the current time. I save hours a year abbreviating these items rather than stopping to think while I carefully type them out. There are plenty of TextExpander gurus writing on the subject already (see the bottom of this post for a few of them) so I have determined that if I have anything to add, it would be to share a few ways I am using it in the middle school band classroom. It is so much easier to enter this string of text with TextExpander. 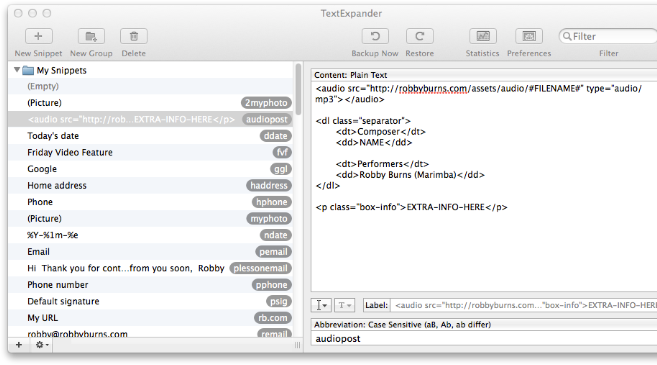 All I need to type in my blog post is “audiopost” and TextExpander writes all of that code out for me. I deal with about 90 kids on a regular basis. I am responsible for teaching all of them, and therefore, maintaining informative and supportive relationships with their parents. Keeping parents informed when half of them are asking me very similar questions throughout the week can be tedious and frustrating. Thank you for asking about the Playing Chart. The Playing Chart is a reflection of the actual practice that students do throughout the week. Though I will assign various different exercises, warm ups, and concert music to be practiced throughout the year, the “Homework” part of the grade is from the Playing Chart itself, which is a reflection of the practice. Each student is to practice three times for ten minutes a day. I consider the letter “A” to represent ten minutes of warm-up activities. Letter “B” stands for exercises, etudes, and other melodies from the method book. Letter “C” represents concert music. When each of these tasks is worked on during a night of practice, the student will check off that letter on the chart. When the week is over, a parent signs the chart and the student turns it in during sectionals the following week. Please do not hesitate to contact me if you have any other questions. Notice some funny text appearing in the middle of that message. This is another fantastic feature of TextExpander. When I type in an abbreviation, I can choose to have TextExpander show a pop up window with some fill-in fields before it expands the text. In this case, I want the email to reflect the class I am sending out late and the amount of minutes late they can be excused. See what this process looks like below. It seems like multiple steps, but it is really just a few keystrokes. The custom controls that allow me to create this pop up window can be viewed by clicking on the cursor icon and selecting “Pop-Up Menu.” All of the other dynamic text options can be discovered in that same menu. Note that I tend to describe these messages as “automated” when I send them. Even though they are not, I like to put something in there that lends itself to the generic tone of the email. Speaking of the fillable form snippets, I have a great one that automatically generates sub plans for me based off a DVD series I use frequently. My school owns Leonard Bernstein’s Young People’s Concerts series. It is perhaps personal preference, but I am not a big fan of letting my students play their instruments while I am out. I won’t advocate that viewpoint here, but let’s just say I tend to lean on the side of using videos when I am out. The snippet “xsubplans” brings up a pop up menu, allowing me to choose the DVD number and chapter, and type some reflection questions in the larger text field. When this snippet is entered into a word processor, I have an instant template for a sub plan involving one of the videos from this series. I hope this attempt to detail some of the practical uses of TextExpander will inspire a few of my colleagues to give it a chance. You can try it free by clicking here where you can also purchase for $34.95. Smile, the developers of this app, also just released a keyboard app for iOS that will allow you to use these snippets on your iPhone or iPad. Your library of snippets can sync over Dropbox so there is no need to worry about keeping them up to date. To learn more about the features of TextExpander, check out their website here and their tutorials here. For great examples of how snippets can be used in a powerful way (and some downloadable sample snippets to embellish your library), check out MacSparky and Brett Terpstra’s websites. Feel free to contact me at robby@robbyburns.com if you have any questions.